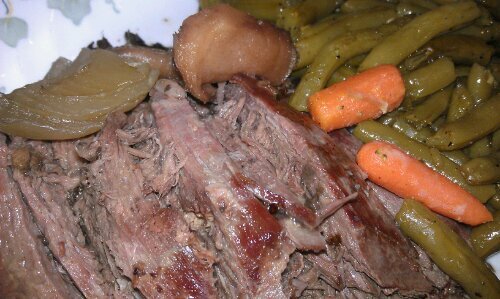 Tastes like beef roast, and you can probably get it for free if you know the right people. Here in the Dakotas, birds fill the air in migration South. Hunters flock to the region for goose, duck, and pheasant. Local area wives “man” the house solo as the men vacate four walls in favor of the vast openness of the wide prairie. The men return from their forages with tough, fatless fowl that the women have to figure out how to serve to young, persnickity children and expectant husbands. For wild goose, expect dark meat like beef! 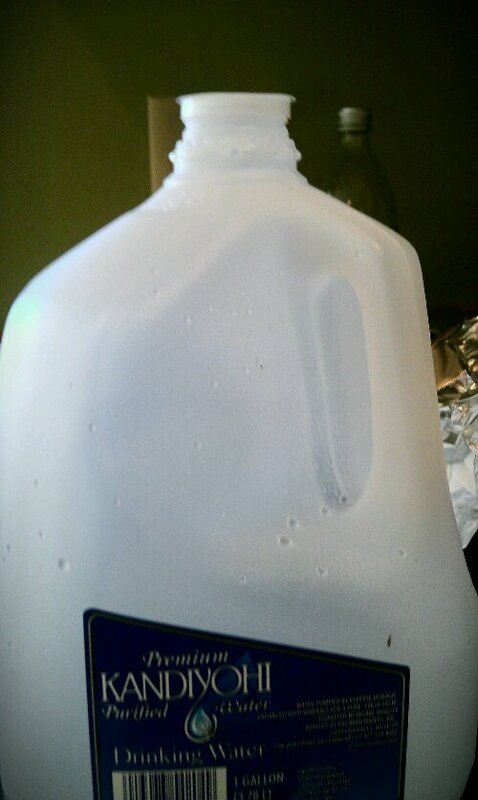 The challenge is to keep it moist and tasty. We have been given two whole geese this fall, and a couple of breasts. I guess it’s really easier to just “breast them out” since getting the feathers off a large goose can be very challenging. But our source was very kind and de-feathered the whole birds for us. A good friend gave us our geese and proceeded to describe this wonderful method for roasting it. If you get a goose, this is a great way to prepare it. When it’s all done, boil the leftover bones to make broth and then use the leftover meat to make SUPER vegetable soup! I swear, it’s just like vegetable-beef soup! I am very happy with this recipe and will be using it again! 1. Preheat oven to 250 degrees. Rinse goose and pat dry. 2. Place goose on a rack in a large roasting pan. I actually put the breast up, but I don’t think it matters. 3. 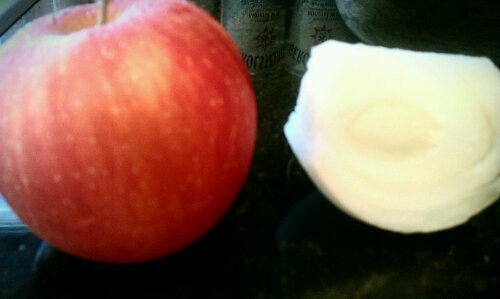 Core and cut apples into eighths and chop onion coarsely. Mix. 4. 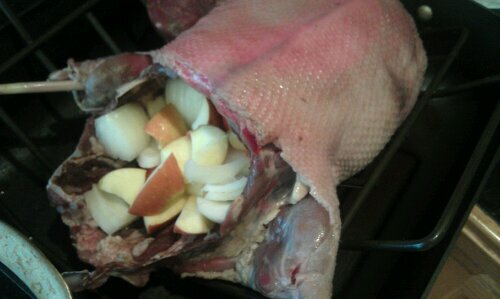 Stuff the apples and onions into the cavity of the goose. 5. 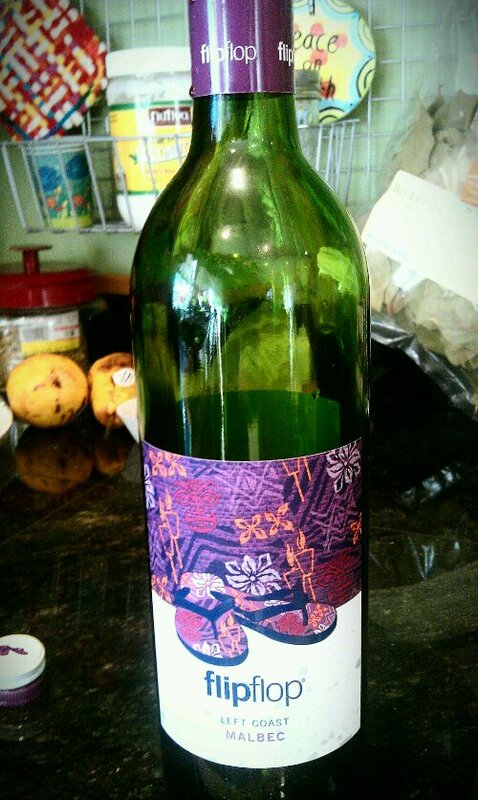 Lift the goose and pour some red wine into the cavity of the bird and pour the remainder of the wine over the goose. 6. Sprinkle goose with salt and pepper as desired. 7. Fill bottom of roasting pan to about 1/4 full with water. 8. 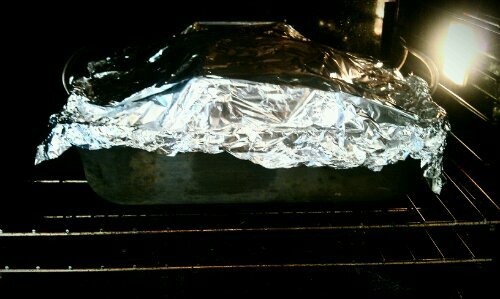 Cover with aluminum foil or roasting pan lid. 9. Place in oven and roast for 6-8 hours. I know. I know. That’s quite time span! I cooked ours for 8 hours, and it was good and moist. But my friend has cooked them anywhere from 6-8 hours. I did not remove the foil to crisp up the skin. I don’t know if this would work or not. This entry was posted in Recipes and tagged best wild goose recipe, GAPS, SCD, Wild goose recipe on November 7, 2012 by thehomeschoolingdoctor.